My friend Scott and I have been friends for over three years, and in that time, we have never gone out for dinner together. Sure we've eaten Quizno's subs at our desks at work, and even shared a Paparoni pizza from Papa Gino's in the break room, but we've never actually gone to a restaurant, sat down, and ordered a meal together. 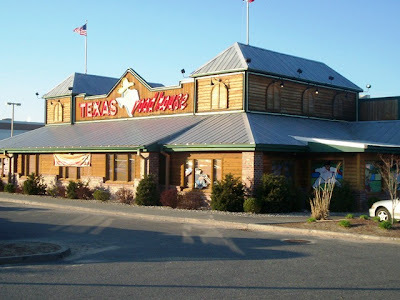 Since we're both big fans of Texas Roadhouse, and we both magically had some cash on hand at the very same time, we decided to have dinner at the Roadhouse at 124 Westgate Drive in Brockton, MA. Although Mom likes the food here, she's not a fan of the noise (and there is a lot of noise), so today was the perfect time to do a review of the restaurant. I met Scott at his office (my old job - *sigh*) and drove to the Roadhouse. We arrived at about 6:30 p.m.
By the fullness of the parking lot, we both knew that the restaurant was quite crowded. Luckily, Scott scored an awesome parking spot and was pretty happy with himself because of it (apparently he always has a long walk to the front door). Once inside, Scott and I had to wait in a small line that had formed around the hostess station. I noticed that there were also people sitting in the waiting area, which consists of a small TV, large barrels of peanuts, and two wall-length benches. A few minutes went by before Scott and I finally had a chance to tell the hostess that we wanted a table for two. Thinking that we were going to wait a while for a table, I was pleasantly surprised when a waiter came over, grabbed a basket of buns from the warming shelf by the kitchen, and started walking us to our table ... and walking ... and walking. He walked so damn slow that I was basically stepping on the back of Scott's sneakers. Even Scott turned around and whispered, "Are we ever going to get there?" I guess the waiter was trying to make small talk by asking, "Have you ever been here before?" When Scott said yes, the waiter turned around and said, "Welcome back." Doesn't seem like much, but apparently Texas Roadhouse teaches the wait staff to really drag this part out. This is not the first time I've encountered the slow walkers. Mom, who normally walks very slowly, was pretty much walking up the waitress's back on our last visit to the Dartmouth, MA, Roadhouse. Nonetheless, we finally arrived at our booth. He put down our basket of buns and told us that our waitress we be over in a minute. I reached over and handed Scott one of the plastic-covered menus that were already on our table. Although we already knew what we wanted, it's always fun to look at the menu. A few minutes went by before our waitress came to the table. Her name was Tina Marie and she seemed to be in a bit of a rush. Although friendly, she talked very quickly. She may have had a lot of people to serve that night, so I don't blame her for speeding things up. I'm the same way. She took our drink order - two Diet Cokes - and since she noticed that we already knew what we wanted, she took that order as well. 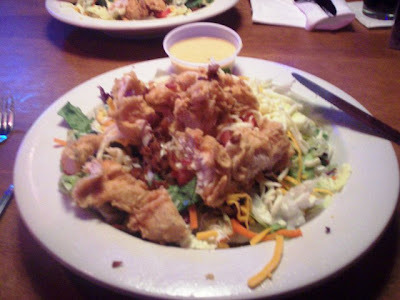 Scott and I were going to start with the Rattlesnake Bites ($4.99) as our appetizer, and Chicken Critter Salads ($9.29) as our entrees, both with honey mustard dressing. He ordered his with egg, and I (of course) requested that the egg not be there. Tina went away to put in our order, but quickly came back to bring us our sodas, which were served in real glasses. In the meantime, Scott and I stuffed our faces with the delicious soft buns with flavored butter and the nearby peanuts, which are placed at every table in a silver bucket (with an extra bucket for the empty shells). Texas Roadhouse is a really well-decorated restaurant chain. As soon as you step through the door, you are transported into a world of cowboy hats, rodeos, and line dancing - and yes, there is actual line dancing. Whenever you hear the country music that is piped in through a large jukebox get turned up louder than normal, be sure to turn toward the middle of the restaurant where you will see the waitstaff busting a move. A cute touch, but not so cute if you're waiting for your food to arrive and your waitress is in the middle of the Boot Scootin' Boogie. The restaurant is also on the loud side. I often find myself screaming across the table at my dining companion even though they are only about two feet away. Also, it is always crowded, so it really doesn't matter when you visit - there is a pretty good chance you'll have to wait to be seated. Once seated at your table or booth (there is a mix of both, but the booths can be a little tight), you'll be able to check out all the crazy knickknacks scattered around the restaurant. There are several caricature drawings of country stars hung up around the top of the bar, cacti, cowboy boots, saddles, and any other stereotypical southern trinket. I'm also pretty sure that you can request your margarita to be served in a cowboy boot that you can keep as a souvenir! If you're on the shy side, I wouldn't suggest coming here on your birthday. If one of your "friends" decides to tell the staff that today is your special day, not only will a group of waiters flock to your table to embarrass you, they'll shine one of the overhead lights right on you, scream "Yee Haw" in your face and get the rest of the diners to do the same. Oh, and they'll tell everyone your age. "Doris is turning 58 today ... yeeeeeee haaaaaaaaaaw!" No thank you. I'd kill myself, and take everyone with me. 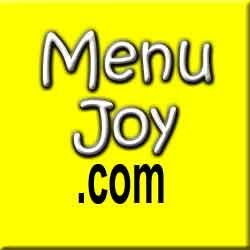 Since this is a chain restaurant, the menu could vary depending on where you're located. Appetizers include the Cactus Blossom ($5.99), grilled shrimp ($6.99), and the cheese fries ($4.99). There are also several salad options that you can get served with homemade dressing. Mom especially likes the chicken Caesar salad ($9.29). Burgers and sandwiches include the pulled pork sandwich ($7.29), and the Smokehouse burger ($7.79) which is a half pound of fresh ground chuck with sauteed mushrooms, onions, BBQ sauce, and jack and cheddar cheeses. There is a kids' menu, a dessert menu (featuring a Big Ol' Brownie for $4.99), and a long list of side dishes, but the main attraction here are the steaks. Each plate is served with two sides, and you can choose to smother any steak with mushroom, onions, gravy, or cheese for $1.99 extra. Steaks include the USDA Choice Sirloin ($8.99-17.99), Ft. Worth Ribeye ($13.99-18.99), Texas T-Bone ($19.99), New York Strip ($16.29-18.99), Dallas Filet ($14.99-18.49), and the Prime Rib ($14.29-18.99). Another favorite is the Texas Roadhouse ribs ($12.99 half slab; $16.99 full slab) that are "blue ribbon" winners and slow cooked with a blend of seasonings and their signature BBQ sauce. You can also order a Texas Size Combo platter of steak, chicken, or ribs for $15.29-18.99. For those non-red meat eaters, there are a variety of chicken and fish options available. Fish dishes include the fried catfish ($10.99) and grilled salmon ($13.29), which the chicken dishes include grilled BBQ chicken ($9.99) and country fried chicken ($10.29). 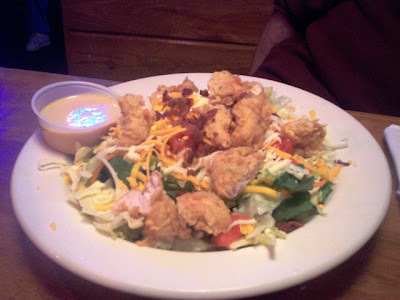 I need to start leaving my Chicken Critter Salad obsession behind so that I can try some of Texas Roadhouse's other delicious entrees. It didn't take long for our appetizer to arrive. Scott had never had the Rattlesnake Bites before. We were both a fan of the Iguana Eggs that they used to serve (kind of like their version of a jalapeno popper), but of course, they took them off the menu. The Bites were served with a cup of Cajun horseradish sauce and were really tasty. 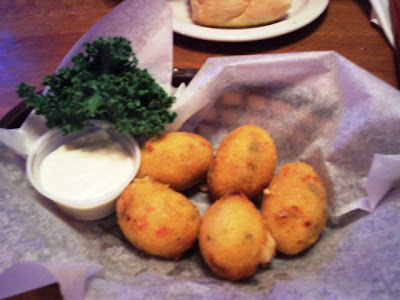 The little bits of diced jalapenos and jack cheese were spicy and the batter was nice and light. Delish! After we polished off our Bites, our salads arrived. Thankfully they remembered to keep the egg out of mine. Both salads looked and tasted amazing. The greens were fresh, the cheese was tasty, the bacon was crisp, and the chicken was juicy and well cooked. I adore this salad because you really do get a lot of flavor with every mouthful. Of course, Scott had some extra flavor going on in his because of the egg, which he really enjoys. We both finished every bite of our huge salads, and I found out something about Scott - he eats slowly!!! I was finished with my salad long before he was. Maybe I eat too fast? Could it be? Either way, we were both glad to be having one of our favorite salads together. While Scott was still eating, I decided to check out the ladies' room, which is almost always disgusting (well, the one in Dartmouth is, at least). It actually wasn't bad today. A little disheveled, but Texas Roadhouse does get a lot of bathroom traffic. Not sure if that is a good thing. After some confusion about how we would split the bill, we decided that Scott would pay the $34.86 and I'd leave the tip. Sounded good to me! Normally, I would have left $7 (20% tip), but I wasn't paying attention when Scott told me to leave $8. Later on, when I did the math, all I could think about was that extra dollar I left on the table. WHAT A CHEAPSKATE!!! Sometimes I'm such a stickler, especially when it comes to money. It's probably because I don't have that much of it. Stuffed, Scott and I made our way across the slippery floor to the door. Seriously, sometimes all the peanut dust and shells scattered around slicks up the floor, so be careful! The restaurant was really starting to fill up, so I was glad to be out of there before the Friday night rush. We got in his car and headed toward the Showcase Cinema in Randolph for a night of horror movie watching, but our Roadhouse meal turned out to be a lot better than the flick. 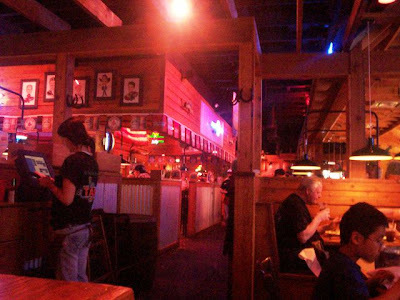 Actually, I've never had a bad meal at Texas Roadhouse which is why I keep going back - even despite spontaneous dancing, rank bathrooms, and obnoxious birthday celebrations. What can I say? I just love that Chicken Critter Salad. Yee Haw!! The Brockton Texas Roadhouse is open from 4-10:30 p.m. Monday through Thursday, 4-11 p.m. on Friday, 11:30 a.m. to 11 p.m. on Saturday, and 11:30 a.m. to 9:30 p.m. on Sunday. 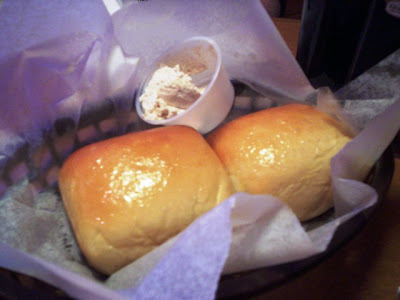 Visit www.texasroadhouse.com for local restaurant hours, menus, and prices.